So… I’m sorry, all due respect to James but I’m going to have to call shenanigans on this one. Why? Well, let’s go through his three points. A couple years ago, OSGi started to move into the server and enterprise space. Now, I can’t find any major application server that doesn’t use OSGi under the covers. From IBM’s Websphere, GlassFish to SpringSource’s dmServer. 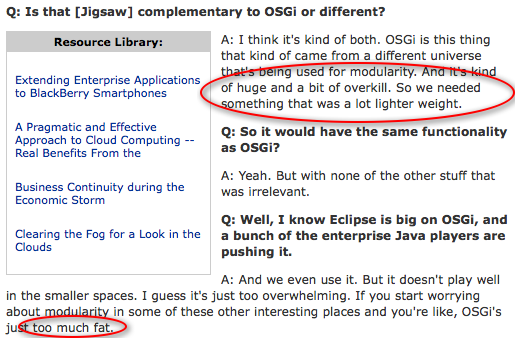 So on the contrary James, I believe OSGi is well entrenched in the universe we live in. In fact, OSGi has continued to evolve since its inception, the specification didn’t come out of nowhere. 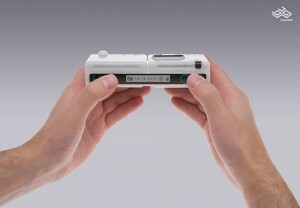 Heck, you can even plug a device into your wall socket that runs OSGi. I can go on and on… so what’s my point? If James wants to talk about OSGi, he should learn more about it first, otherwise he perpetuates misconceptions that help no one. I think we all agree that modularity is a good thing for the software industry and we should be working together to push that concept forward. On a side note, James, if you want to learn more about OSGi and its history, I would gladly set some time aside to chat. I’m sure people like Peter Kriens and BJ Hargrave would do the same. You’re also welcome to attend a free OSGi mini-course that Jeff McAffer and I are giving on Equinox and OSGi in a couple of weeks.